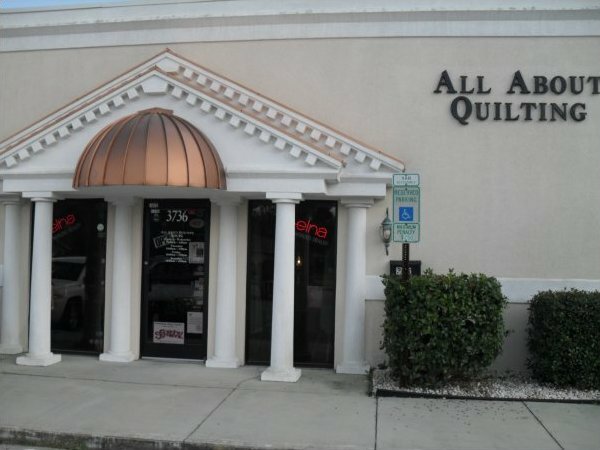 All About Quilting is locally owned and operated by Kirsta Meadows with over 30 years of experience. Starting out as a hand quilter (hand piecing and hand quilting) in classes while on recruiting duty in Minnesota (first formal training) to getting certified as a Quilt In A Day Instructor under Eleanor Burns, I have lots of experience to share with one and all. I help beginning and experienced quilters with all their quilting needs. Whether it is learning the quilting basics and how to use their machines or picking out fabrics for the next class. Open Monday through Wednesday 10 - 5 Thursday 10 - 7 Friday 10 - 5 and Saturday 10 - 4! I strive to maintain an open and friendly atmosphere for complete comfort. I have some of the best customers who have become dear friends. Quilting friends are the best ones to have! They are the only ones who understand us when we say we're getting more fat quarters, they know we aren't talking about our rear-ends! We sell Elna brand sewing machines and a variety of quilting supplies. If you need to pick up fabrics we only carry the best quality like Island Batik, Blank, Timeless Treasurers, South Seas, Foust Textiles, Studio E and many more. The same goes for our notions, you will find Omni-grid, Fiskars, Roxanne, Schmetz, Quilt In A Day and others. We carry top quality threads-- Mettler, Wonderfil and Gutterman. So stop in, check us out and stay awhile. We are here to help you with your with next quilting project if you are wanting a quality sewing machine or taking a beginner's class, we are here for you! We are located in Jacksonville, North Carolina~~Home of Camp Lejeune Marine Corp Base and some of this nations finest Marines (my husband Kevin and my son Nicholas). We hope to see you soon, click on the locations link to get driving directions and stop in and visit.